Arizona has a lot of desert, and the desert is a dusty place. The Sonoran Desert in Arizona covers both the Phoenix and Tucson metro areas, where dust storms are common during certain times of the year. Some people confuse dust storms with monsoon storms. We do have monsoon in Phoenix, and there are dust storms and occasional rain during that season. The Arizona monsoon usually begins in July and ends in September. But we have dust storms at other times of the year, too. Whether it is monsoon in Arizona or not, dust storms can be frightening--and beautiful! Enjoy these pictures of Arizona dust storms and monsoon storms. If you have pictures of Arizona storms that you'd like to add to the photo gallery, here's how you do it. Please tell me the date of the photo, and where, approximately, it was taken. Enjoy these pictures of Arizona dust storms and monsoon thunderstorms. If you have Arizona storm pictures that you'd like to add to the photo gallery, here's how you do it. Continue to 2 of 66 below. Continue to 3 of 66 below. Continue to 4 of 66 below. Continue to 5 of 66 below. Continue to 6 of 66 below. Continue to 7 of 66 below. Continue to 8 of 66 below. Continue to 9 of 66 below. Continue to 10 of 66 below. Continue to 11 of 66 below. Continue to 12 of 66 below. Photo © 2006 Stephen Forbes, used with permission. From the photographer: "This shot was taken in Gilbert on the 7th of June just after a killer dust storm with heavy rain. The photo is a result of dust in the air as well as me telling my camera that it was indoors under tungsten light. The result was the enhanced purple and gold tones. I shot one photo a minute for half an hour in an attempt to capture the entire color spectrum. The shot before this one is lighter and the one after it is heading to blue. This lasted for 60 seconds!!!" Continue to 13 of 66 below. Monsoon Sunset Photo © Brad Lawrence, used with permission. Continue to 14 of 66 below. Dust Storm Rainbow Photo © Chip, used with permission. Continue to 15 of 66 below. Continue to 16 of 66 below. Continue to 17 of 66 below. Monsoon Photo © Brad Lawrence, used with permission. Continue to 18 of 66 below. Monsoon Photo © July 30, 2007 Veronica Lebron, Surprise, AZ, used with permission. Continue to 19 of 66 below. Continue to 20 of 66 below. Continue to 21 of 66 below. Monsoon Rainbow Photo © Trish Gunther, used with permission. Continue to 22 of 66 below. Continue to 23 of 66 below. Continue to 24 of 66 below. Continue to 25 of 66 below. Continue to 26 of 66 below. Pictures of Arizona dust storms, monsoon thunderstorms and monsoon damage. Continue to 27 of 66 below. © 2008 Jeff Hedding, used with permission. Continue to 28 of 66 below. Continue to 29 of 66 below. Continue to 30 of 66 below. Continue to 31 of 66 below. © 2008 Dan Raustadt, Bigger Picture Images, used with permission. Continue to 32 of 66 below. Continue to 33 of 66 below. Continue to 34 of 66 below. Continue to 35 of 66 below. Continue to 36 of 66 below. © Merle Shown, used with permission. Continue to 37 of 66 below. Continue to 38 of 66 below. Continue to 39 of 66 below. © Samuel Tyree Williams (age 10), used with permission. Continue to 40 of 66 below. © Elizabeth Smith, Rio Salado Habitat Restoration Area, used with permission. Pictures of Arizona storms, monsoon thunderstorms and monsoon damage. Continue to 41 of 66 below. Continue to 42 of 66 below. Continue to 43 of 66 below. 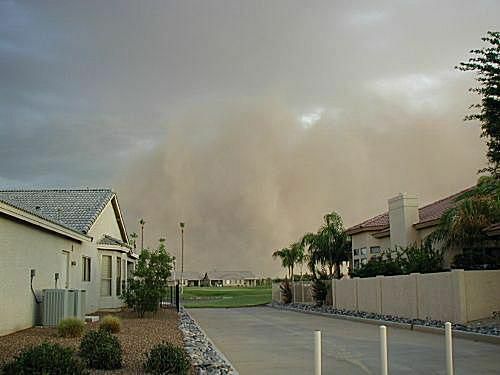 On July 5, 2011 The Greater Phoenix area was enveloped by a massive wall of dust, called a haboob. Continue to 44 of 66 below. Continue to 45 of 66 below. Continue to 46 of 66 below. The red rocks of Sedona, Arizona are lit up by lightning during a monsoon storm in Sedona, Arizona. Continue to 47 of 66 below. Monsoon in the Phoenix area doesn't always mean rain -- sometimes it just means a lot of dust. Continue to 48 of 66 below. © Michael R. Venokur, used with permission. Monsoon thunderstorm in Cave Creek, Arizona on July 30, 2011. Continue to 49 of 66 below. Monsoon storms usually take place in the late afternoon or evening. In this photo the ominous dark skies indicate that a storm is on the way. Continue to 50 of 66 below. © Isabel Theile Graves, used with permission. Continue to 51 of 66 below. Continue to 52 of 66 below. © Cindy Bilsing, used with permission. Continue to 53 of 66 below. Continue to 54 of 66 below. © Steve Forbes, used with permission. Continue to 55 of 66 below. Pictures of Arizona dust storms, haboobs and monsoon thunderstorms. Continue to 56 of 66 below. Continue to 57 of 66 below. The Mogollon Rim in Arizona is north of the Phoenix area. Often referred to as just "the Rim", it includes the areas around Payson, Arizona. Continue to 58 of 66 below. Learn more about monsoon storms in Phoenix. Continue to 59 of 66 below. This is a different perspective of our summer monsoon storm. It's the beauty that remains when the storm is over. Learn more about monsoon storms in Phoenix. Continue to 60 of 66 below. Continue to 61 of 66 below. Continue to 62 of 66 below. Continue to 63 of 66 below. Continue to 64 of 66 below. Continue to 65 of 66 below. Continue to 66 of 66 below. This photo was taken during the Arizona monsoon of 2016. From the photographer: "Duststorm in Scottsdale taken from my patio on August 21st."